When I think about being on board a spaceship that feels real, I think of C.J. Cherryh’s Alliance Universe series. 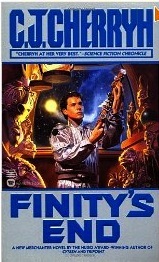 Finity’s End was a surprise in that I expected an end of the universe story, and got a space ship named “Finity’s End” instead. The story deals with the transition from war to peace and how the merchants who travel space have to survive in the uneasy new alliance. Also in this series is Tripoint, which is the story of a young boy whose mother was raped by a ship’s captain and has preached revenge to her young son his whole childhood. The boy is kidnapped by his step-brother onto his father’s ship where he has to deal with strained family ties, and the truth. Merchanter’s Luck, also in the series, is about the merchant ships who ply the spaceways and the big conglomerate ships who starve out the small independent ships. It has the feel of spaceships and the details of living on them that Cherryh is so good at. Others: Rim Runner, and Down Below Station. (received a Hugo) I am currently interested in this series because I am editing my novel about a space voyage on board a ship in Past the Event Horizon and want to get that same virtual feel that Cherryh gives. 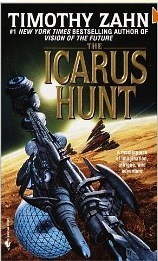 Another good space voyage novel is Timothy Zahn’s Icarus Hunt. This is about the pirate captain who you can’t help but like. Again, the gritty life among the stars that holds danger and starvation at every turn as crew and captain try to hold the ship together at all costs. A surprisingly good read. With a touch of romance thrown in. When I asked my writers group what their favorite science fiction was, my military guy said, “John Campbell and his Lost Fleet Series.” This is a popular series of a renegade military ship on several space adventures. Black Jack Geary, is pulled out of “survival hibernation” to lead a fleet of ships against the alien enemy. He has to overcome his earlier hero persona and the myth that has grown up around him over the last many years. I have read the first three and agree that it’s good, but I think you military types will enjoy it even more. Now the most recent (May 2012)The Lost Fleet:Beyond the Frontier has come out and continues Geary’s story. This time he is caught between two alien enemies and an antagonistic high command. 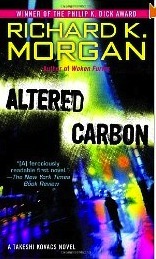 I showed up at Powell’s bookstore the other night thinking that Richard Morgan of Altered Carbon (won a Hugo) fame was speaking. It turned out that a book club had read him and was discussing his novel. Still, I met some nice ladies and had a good discussion. Interesting that one saw a religious tone to his book. I considered the question of how would our world be changed if we could be immortal? If we each had a cortical stack with a back up locked away. The group read it as a mystery. The mystery being that a murder is committed and the protagonist has been “backed up” and brought back to life, but the time of the murder is missing in his memory and evidence suggests that he was the murderer. What happened between his last saved identity and recent events? What I thought was my unique discovery turns out to be the number#1 book on the recent TOR’s best science fiction of the decade list. 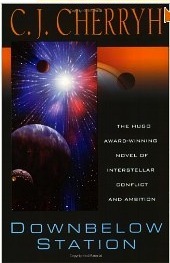 Not to mention it made the Hugo nomination in 2006. Do I have good instincts or what? I went on to read Last Colony which was nominated for a Hugo 2008, Ghost Brigade 2007 Prometheus award nomination and Zoe’s Tale, also nominated for a Hugo in 2009. John Salzi started by winning the John W. Campbell award best new sfwriter in 2005. So I checked him on twitter and found out that he is a seriously funny man. Best twitter notes ever. 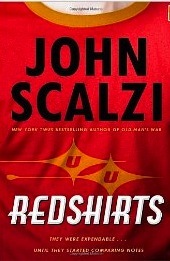 He just came out with a new book, Red Shirts. Check it out. Scalzi takes old men and downloads their experience into young buff military bodies and sends them off to fight aliens in order to protect Earth. Richard Morgan does the same, but his guy is more of an interstellar mercenary. His series takes on a cyberpunk noir type atmosphere. NOT FOR THE FAINT OF HEART. 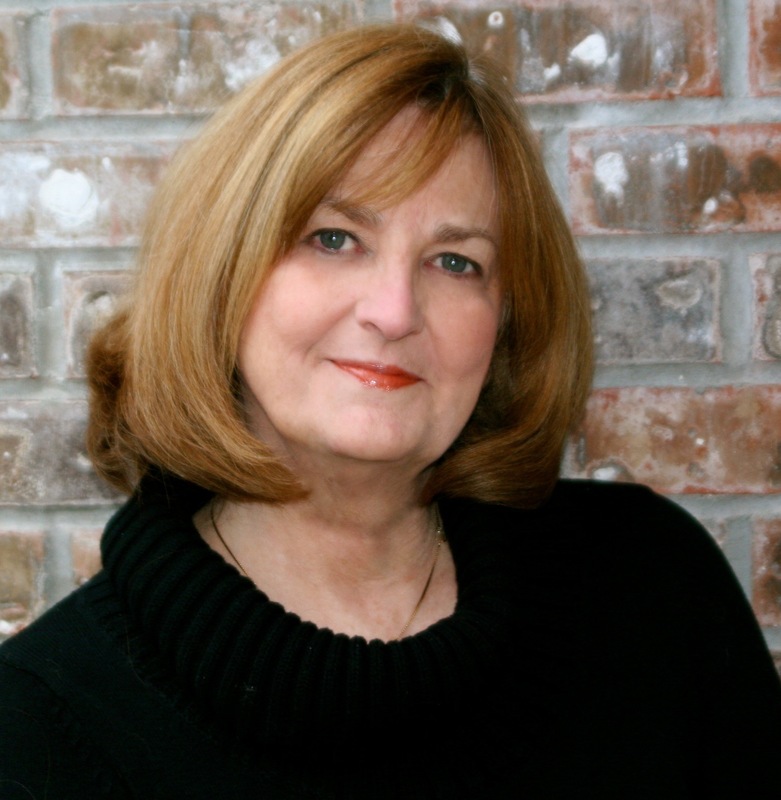 Both writers use the idea of disposable bodies–which is perfect in a military setting. Both writers put their protagonist through an identity crisis. After reading all the above books, I was having a bit of one myself. What do you think? Hello, hello. Why does my iPhone do everything but have a decent phone conversation?